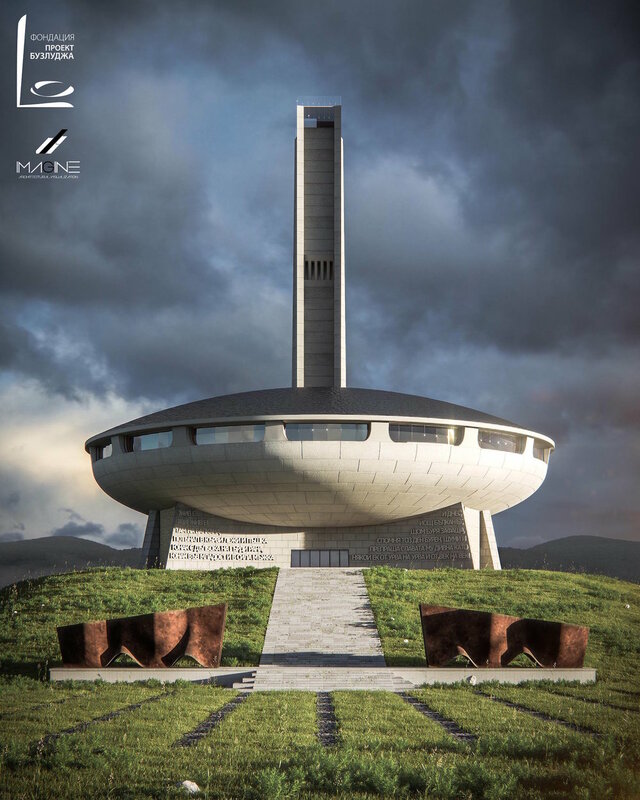 The Buzludzha Project is a design proposal for the conservation of the Buzludzha Memorial House. The project was created by the Bulgarian architect Dora Ivanova, who initially presented and defended it for her 2014 master’s thesis in architecture at the Technical University of Berlin. The proposal has since been developed to incorporate feedback gathered during the dozens of public discussions that she organised and chaired between 2015 and 2018. The Buzludzha Monument is unique in terms of its history, architecture and art. Even in its current decayed condition, thousands of people travel from around the world to visit the site – and many of them are left with unanswered questions: How and why was such a structure built? What was it used for? What do the mosaics represent? How was it destroyed and why? Preserved in the form of a museum, Buzludzha will provide answers to all of those questions. The Buzludzha Memorial House was built to celebrate the Bulgarian Communist Party – and so any painstaking, loving recreation of the monument in its original form could give the impression of celebrating those same ideologies. We don’t want to do that. But neither will this project adapt or repurpose the monument, forgetting or disguising its original intention. What we want is to preserve this unique work of architecture, while offering a critical and objective explanation of its history and purpose. We believe that traumatic history should never be forgotten… but instead be remembered, explained, discussed, and used as a basis for further education. The main hall will be used for cultural, historical, educational, arts and music events. The auditorium design, as it currently stands, can host up to 500 people, and by harnessing this space for small to mid-sized events it is believed that the venue can contribute to the national and social significance of the monument. An objective and critical analysis will be offered for the mosaics decorating this interior space. These will be preserved in their current state, with roughly 80% of the original artwork surviving. The mosaics detail key historical events and personalities from the communist period, and will be used to explain not only the ideas behind communism, but also the propaganda that the system created about itself. The corridor between the inner and the outer mosaic rings will be dedicated to the political and social repressions under Bulgaria’s communist government. Visitors will learn about the prisons, the extensive citizen dossiers and the feared internal security forces, through an exhibition of documents and dissident accounts. The outer ring of mosaics presents scenes of everyday life during communism. It depicts themes such as industrialisation, military power and domestic life, and here visitors will learn about the reality of life in communist Bulgaria – objectively exploring such ideas as the role of women in communist society, childcare and education, culture and foreign policy. The monument’s basement will be developed to offer a narrative of the monument itself, with a gallery that spans from the history of Buzludzha Peak through to the planning, construction and utilisation of the monument in the 20th century. The gallery will chronicle Buzludzha’s decline, and of course, its preservation. The collection will incorporate: original design sketches for the mosaics, the building’s blueprints, archive records and photography, in addition to more recent photographs of the monument. A glass elevator ascending the 70m tower provides visitors with dramatic views over the mountain terrain. It will pass through the chamber between the 12m red stars, with this space being cleared to allow unhindered views from the interior. Roughly 50% of the red glass currently remains, with missing portions to be secured and insulated. This vertical experience also offers a place for visitors to learn about other communist-era monuments in Bulgaria. The panoramic observation deck at the top of the tower will provide exceptional 360-degree views across the surrounding landscape. A glass ‘sky-walk’ allows braver visitors to walk out beyond the overhang for a dizzying downward view, while a map of the region points out a number of other nearby attractions which may be viewed through the installed telescope. On a clear day, the view stretches more than 100km – spanning the mountain range, the Danube Plain in the north and the Thracian Valley to the south. The project chooses to preserve the monument as a spectacular educational experience – rather than restoring it to its original form, and risk honouring the ideologies it was built to celebrate. This proposal will see many of the building’s interior spaces frozen in their current, semi-ruined state. Through the use of modern technology however, visitors will be able to see Buzludzha’s past glory juxtaposed against its current state of disrepair. The Buzludzha project will use 3D projection mapping to bring the monument to life. Missing or damaged sections of the mosaic can be projected onto the walls, while also allowing vast scope for educational light shows and seasonal exhibits. The museum will take advantage of virtual, augmented and mixed reality formats, to create a truly unique visitor experience. Audio guides will be accompanied by specially developed headsets, allowing visitors to experience immersive and unforgettable self-guided tours.